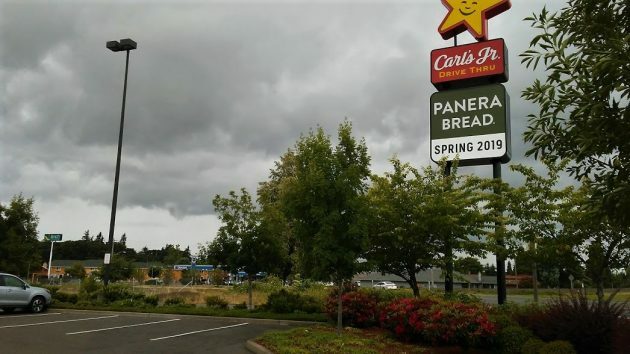 Unlike some other companies, Panera Bread wants people to know early that it’s planning a new outlet. That’s the case in Albany, at any rate, as the photo shows. It will probably be a year or so before the nationwide restaurant and coffee shop chain opens the new store, off Airport Road S.E. But a big sign is already up, and last week people on Facebook took note. The city of Albany’s Planning Division does not yet have a site plan or other land-use application for Panera Bread on hand. “However, we anticipate receiving one this summer,” planner David Martineau emailed me when I asked last week. The new restaurant apparently will occupy the vacant site of the former Tom Tom, at 320 Airport Road S.E. That restaurant was closed for several years before its building was razed in 2013. The parcel at 320 Airport Road is next door to the 300 address, where there’s a Carl’s Jr. 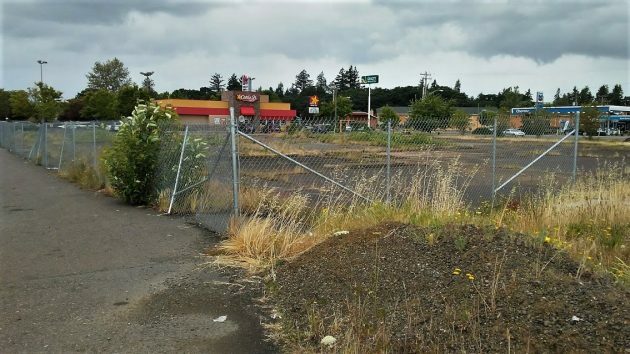 Both parcels are owned by CBT Properties LLC, according to Linn County tax records. The county lists two addresses for the owner, one in Eugene and the other in Lexington, a hamlet in Morrow County. In April, the Albany Building Division issued a permit for a 10-by-10-foot illuminated sign, valued at $15,000, which joined the Carl’s Jr. sign. Panera Bread, headquartered in St. Louis, is reported to have about 2,100 outlets. Eugene, Salem, and Corvallis have at least one each. Unless there’s a hitch, Albany gets one in 2019. The vacant site of the former Tom Tom restaurant, near the sign announcing a new Panera’s. I look forward to this. Healthy, delicious, fresh soups, sandwhiches and salads at a good price. Yea! Nothing better for the local economy than another chain restaurant. More competition for locally owned businesses. Less money stays here, more money for St. Louis. Competition, yes; but perhaps more money stays here (payroll), less money for St. Louis (expenses). Woo hoo! Now we don’t have to guess, another auto parts store, discount cigarette store or pawn shop???? Sounds like a few are disappointed because it is a chain, but they will probably be hiring locals to work there. As for the “chain” part, there’s one dominant opinion I’ve heard (on NPR, etc), or read, many times over a couple decades: customers demand consistency above all else. Food has to be reliably the same wherever you are, and whenever. Hence the appeal of chains. I’m not taking sides, just reporting views from business and sociology. A sign “Spring 2019”. I understand the allure of all that I-5 traffic but is that their crowd? Never been to one. Maybe I will soon. A sign means nothing. Perhaps they should take another look at the wells fargo lot downtown. Just sayin’. Much better fit. No fast food site right next to you. Hmm! I think it is great that lot has been empty for too long. Gives more options to the fast food on that side of town.